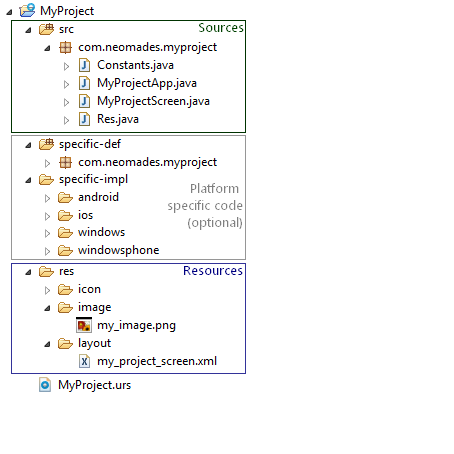 The Java source code of a NeoMAD project must be written using version 1.6 of Java. This is required by the transcompiler that converts the Java source code into any output language. There is only one exception to this rule: Java source code written in (platform-specific code for Android) can be written using Java 1.6. If you are using the NeoMAD plugin for Eclipse, you can automatically create a new NeoMAD project with the right structure to start off. Otherwise, NeoMAD comes with a HelloWorld example in the Examples directory that can be used as a starting point when beginning new projects. In this chapter, we will explain how the HelloWorld application was developed based on an empty NeoMAD project structure.